Derry City dropped to fourth in the League of Ireland table after Sean Houston's injury-time goal earned Finn Harps a dramatic Brandywell draw. A 20th-minute Ryan Curran header looked set to give Harps victory before Josh Daniels' 84th-minute goal was followed by a Rory Patterson strike on 88. But Houston powered in a magnificent header in the first minute of injury-time to level. Nathan Boyle missed a glorious Derry chance with the last kick of the game. Leaders and champions Dundalk are now seven points above the Candystripes after edging a 1-0 home win over Bray on Tuesday evening. Cork City's 1-0 win in Dublin over Bohemians keeps them four points behind Dundalk while Shamrock Rovers move above Derry on goal difference into third spot after beating Sligo Rovers 3-0. 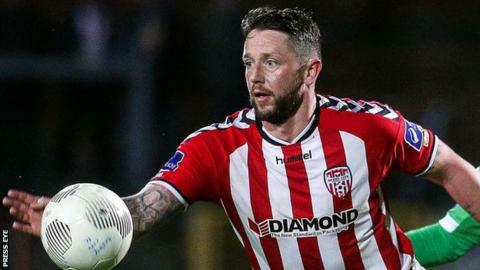 With former Brandywell favourite Barry Molloy in fine form for Harps, the visitors were good value for their 20th-minute lead as Curran nodded into the net after a David Scully shot had come back off the woodwork. Derry did improve before half-time with Patterson wasting two good chances and impressive Harps keeper Ciaran Gallagher also denying Ronan Curtis. As Harps retreated into a defensive shell in the second half, Derry dominated possession but they needed the introduction of youngster Daniels to finally breach their visitors. Daniels, who lost five members of his family including his mother and sister in the Buncrana pier tragedy in March, notched his first senior goal for Derry on 84 after good work by the impressive Niclas Vemmelund and Boyle. Youngster Daniels then set up Patterson to strike Derry ahead four minutes later with the shot appearing to take a slight deflection. To their immense credit, Harps refused to give up and a clever Kevin McHugh ball released Michael Funston whose cross was brilliantly headed to the net by Houston from the edge of the penalty area in the first minute of injury-time. Inevitably, there was still time for more drama as Boyle somehow managed to side-foot wide from three yards with the goal gaping after a Vemmelund cross. Derry lost 2-1 against Harps in their Premier Division opener in early March.